For the past few chapters, I have been referring to the guild as the “Archery Guild” as “Bow and Arrow” sounds quite dumb for a guild name. However, this may lead to confusion in future chapters as there are more than one archery guilds in the empire. From this chapter onwards, the “Archery Guild” that has been mentioned countless times will be renamed to “Bow and Arrow Guild.” (Direct translation) in case more archery guilds are brought out in the future. Hope you guys enjoy this chapter! Ai Wei Er was at a loss at what to do. According to the legends, the moon bunny was said to have the hidden ability of wielding a bow, which was a highly-valued trait especially for non-combat families like the Rui Bo Te tribe. However, as her talent for archery was never really publicly shown, in addition to the fact that the Soul Engraving Association refuses to help her out after the previous incident with the temple, this made her situation very unique. Even if the temple did end up helping her to soul engrave, there was always a possibility that she ends up with just a normal bow, which may give a reason to the Bow and Arrow Guild from forbidding her entry as well. In her previous test, her offensive abilities were very lacklustre, with her maximum offensive attribute points being capped at only 2 points. Even though this was not terribly bad and can be considered average among the Rui Bo Te family, it was not too spectacular either. As such, she did not expect to face an additional obstacle posed by Lan Duo Fu at this point of time. “Lan Duo Fu, is your skin itching again?” Lan Duo Fu’s face was a total eyesore in Zou Liang’s eyes. After all, every time he saw his face, he could not help but lose his calm. Under his father’s teachings, Lan Duo Fu was able to pick up a new way of threatening others, which was to threaten in the name of having a discussion. Zou Liang started walking towards Lan Duo Fu with his frigid cold eyes. Lan Di and Ke Te was on standby, ready to beat Lan Duo Fu up the moment Zou Liang gives the word. “So you want to fight me? Come, let’s fight then. I see this is how the priests act all the time.” Lan Duo Fu can be said to have learnt his lesson, as he did not take the aggressive approach, instead he chose to back up one step to gain one foot deeper. Regardless, he did not stand any chance against Zou Liang even if they fought, so he might as well take the passive stance. Lan Di and Ke Te could only stand at one side helplessly as they stared at Zou Liang. As much as they want to beat Lan Duo Fu up, this loathsome dog was playing around with words, giving them no reason to do so. Lan Duo Fu was very proud of himself for applying what his father taught him. Hmph! How could these other beastly tribes even attempt to match up to the intelligent Si Nai Ke Tribe? “Wei Wei, you have to consider properly. I am not forcing you.” Lan Duo Fu was happily adding salt to the wound as he basked in the anger of Zou Liang and gang. These bastards obviously wanted to beat him up, but could not do so and were holding it in until their faces turned red, how hilarious! “I have made up my mind. Since the examination date line is over, I have nothing to say.” Ai Wei Er said expressionlessly. She could only resolve herself to be a lowly citizen. After all, if she did not join the Bow and Arrow Guild, she will not have any more chances to join other occupation guild, causing her status to fall to that of the lowest level. Lan Duo Fu continued to try to persuade her as he did not want to let go of this fresh flower as well as her enormous assets backing her. “Lan Duo Fu, you can scram off now. If you continue to talk trash, you can make sure I will break your leg!” Ke Te snorted coldly. Lan Duo Fu said this as he held his head up and threw out his chest, causing Ya Se to finally lose his calm. This caused an uproar among the crowd, with Ke Te and Lan Di being no exception. Ke Te quickly grabbed Zou Liang as he whispered quietly to remind him that this Lan Duo Fu’s influence should not be underestimated. “Very well, everyone here can be the eyewitness!” Lan Duo Fu said proudly as he was very excited with how the situation was proceeding. Zou Liang struck a fist at Lan Duo Fu’s annoying face. 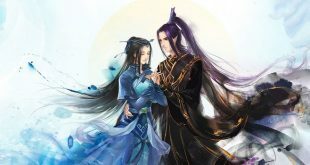 Lan Di and Ke Te gazed at each other for a while, before laughingly walking up to join in the ‘party’ as well. At this point, Lan Duo Fu did not bother counterattacking and merely waited for the fight to end. After the one-sided fight ended, he merely covered his face and left after staring at the crowd with his venomous gaze. “It must be very fun to beat me up right? Don’t worry, I will give you three days of time. After three days, let’s see who will be the one crying!” With that, he let out a cold harrumph before covering his face and quickly exiting the scene. “Ya Se, you should not bother getting involved with someone like him.” Ai Wei Er did not expect matters to escalate to such a state. With her character, she naturally did not like to involve others in her troubles. “… Ya Se, are you certain your plan will work?” Ke Te was more rational than Lan Di, as he quickly inferred that Ya Se must have some plan up his sleeves for him to be so confident. “The Bow and Arrow Guild is not that remarkable of a place. They should be honoured that our Wei Wei will even bother to consider them!” Zou Liang mentioned. At this time, the spectators were all buzzing with discussion. What was this Zou Liang thinking? After offending Lan Duo Fu to such a great extent, how is it possible for his father to even overlook the humiliation and let Ai Wei Er into the guild? “Senior Sis Lu Yao, you are right that some matters can be discussed. However, there are some matters that cannot and should never be discussed as well.” Zou Liang said with a firm tone. “Ai Wei Er, I will look for you after class. Don’t worry about it, just leave this matter to me!” Ai Wei Er could only nod her head as she placed her final hopes on Zou Liang now that she had no other choice. Ideally, she would not want to get involved with Lan Duo Fu as well. However, the stakes of this gamble have gotten a tad too big. “Your excellency, please rest assured. Ai Wei Er had just conducted her examination at the Soul Engraving Association not long ago and her results are very disappointing, with no signs of any innate talent. What bull crap about the moon tribe? I am pretty certain that the Rui Bo Te tribe made that all up. Our Bow and Arrow Guild is made up of the best archers from all around the empire, it is not a place where any random dogs and cats can just enter. Personally, I do not have any hatred towards the Rui Bo Te tribe. Since they are talented in doing business, they should just continue to earn their money and pay us our taxes yearly.” Si Tan Fu explained expressionlessly. Like others, he merely viewed the Rui Bo Te tribe as one of the tools of the empire since they didn’t possess exceptional fighting abilities. Upon hearing this, Sa La was very satisfied with how the situation was proceeding, having suffered scolding from his superiors after Ya Se’s previous fiasco, he could not wait to see Ya Se’s downfall as well. Hmph. In times of war, one should resort to any sorts of methods possible, even if it was not honourable. Ya Se was so rash, daring to claim that the archery guilds will compete… In his opinion, Ya Se’s claim was just a fantasy story.